I have been meaning to post this recipe for a while since it was a delicious make-ahead breakfast and would be a tasty snack as well. 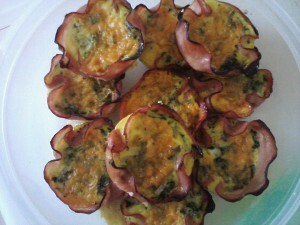 The quiches are lined with meat instead of pastry, so it is low-carb and very flavorful. I modified this recipe and was happy with the results, although it is extremely flexible and could be modified according to whatever ingredients you have on hand. 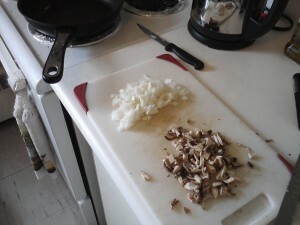 To start, I sauteed half a cup each of minced onion and mushrooms in about a tablespoon of butter. 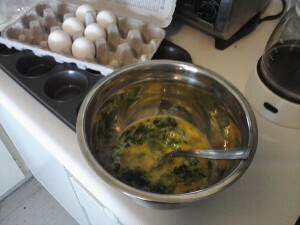 While that was going, I whisked 6 eggs, some cream and a half cup of chopped spinach. I greased the muffin tin then lined each hole with a slice of ham. The package I used had ten slices, and that ended up being a perfect amount! 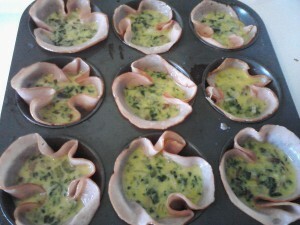 I added the onion and mushroom to my eggs and poured the mixture into the muffin tin. The original recipe called for grated cheese, which I forgot, so I topped each quiche with a slice of cheddar before I cooked them. I put them in the oven, which was preheated to 375 F, and baked them for 18 minutes.